Ziba Medical Spa is taking skin care to a whole new level. We not only correct signs of aging, we give you the power to prevent them in the future. 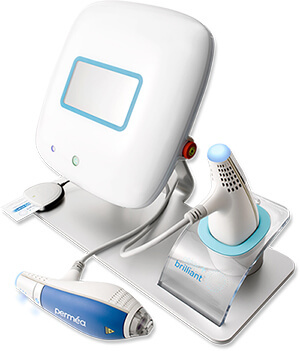 Clear + Brilliant® is a fast, affordable, proactive light laser skin treatment proven to fight the signs of aging. It’s fast becoming one of our most popular procedures. After just one 20 to 30 minute session, your skin looks and feels renewed, firmer, more luminous from the inside out. It’s the ultimate facial! Clear + Brilliant® treatments are beneficial for women and men of all ages and safe for all skin types. Perfect for improving: skin tone and texture, reducing pore size, correcting acne problems, sun and other environmental skin damage, and it keeps those fine lines and wrinkles at bay. The results are both immediate and progressive. Your skin actually improves over time! Your Ziba Skin Care Professional will recommend an individualized skin care plan after your first treatment.